A £13.4m grant for a housing project in south Warwickshire could increase the amount of affordable housing at the site, a council claims. The government funding will go towards infrastructure at the proposed Long Marston Airfield Garden Village. Stratford-on-Avon District Council is one of 133 council-led schemes to benefit from the government funding. 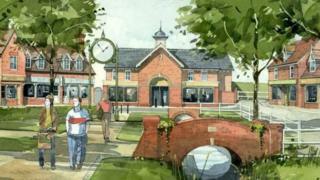 Development of the former Ministry of Defence and RAF site was given the go-ahead last year. Council leader Chris Saint said he expected the funding from the Housing Infrastructure Fund would "improve the viability" of the site. The development has "significant and unusual cost pressures" he said, including moving an underground high pressure gas main that crosses the area. The money will also go towards a new main gas supply and improving local road infrastructure. A total of 3,500 houses are proposed for the predominantly brownfield site. Outline planning permission has been granted for a first phase of 400 homes, with the remainder to be delivered over the next 20 years. £9.6m national funding was also awarded to Warwick District Council to support delivery of school and sports facilities in Kenilworth. £12.7m was given to Coventry City Council for work to kick-start the Eastern Green Development next to the A45 near Coventry.